A fat, bald red priest from the Free City of Myr, Thoros has resided in Westeros for a number of years since he came to the court of King’s Landing. Despite his being a priest, he is better known for enjoying women, wine, and warfare. He is a noted figure on the melee grounds thanks to his trick of using wildfire on his sword blades to frighten the horses of his foes (and his foes as well), and won renown when he was the first man through the breach at Pyke at the end of Greyjoy’s Rebellion. Thoros joins Lord Dondarrion in his expedition against Gregor Clegane. 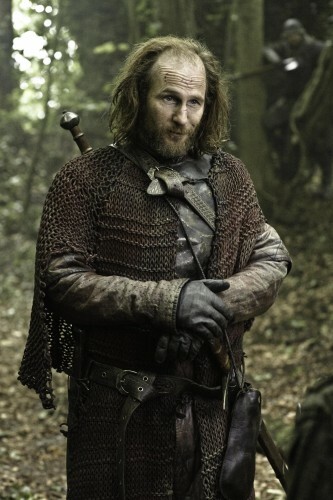 Paul Kaye really looks nothing like Thoros, who is older, much less hairy, and probably a deal darker in appearance. The character is not mentioned at all in the series and its first two seasons, unlike a number of references to him in the first two novels establishing his fame, reputation, and involvement with Dondarrion.